Cardiovascular diseases remain a major health concern worldwide. It is still the leading cause of premature death globally especially in low and middle income countries. Our nation struggles with the socioeconomic impacts of cardiovascular diseases and has gone through changes in its healthcare system in an effort to reduce this burden. Medical professionals are expected to manage this ever increasing problem accordingly. Optimal management of cardiovascular diseases requires collaboration of healthcare providers working in every level. Our commitment as medical professionals in providing high quality cardiovascular care necessitates continous update on groundbreaking cardiovascular research and breakthroughs which form the basis of evidence-based practice. 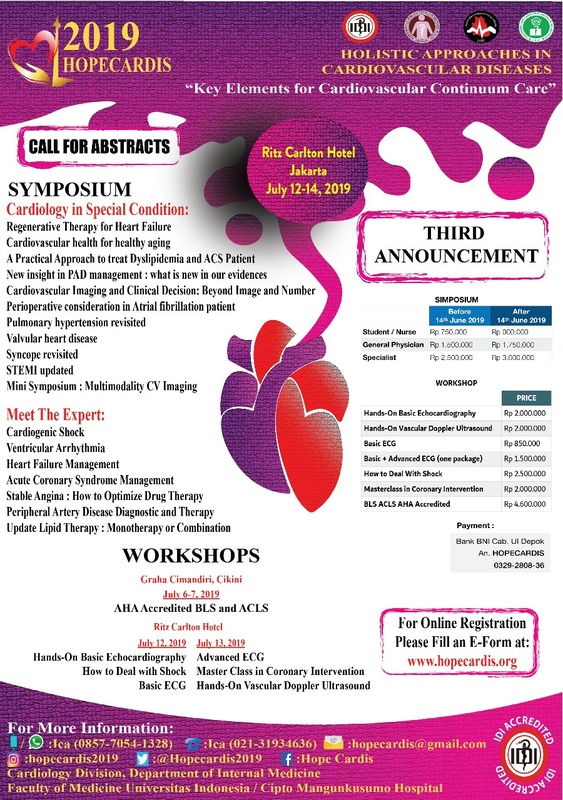 To facilitate this need, Continuing Medical Education of The Indonesian Society of Internal Medicine and in collaboration with The Indonesian Cardiocerebrovascular Society (ICS) also with Cardiology Division, Department of Internal Medicine, Universitas Indonesia-Cipto Mangunkusumo National Referral Hospital will be holding the annual scientific meeting, Holistic Approach in Cardiovascular Disease (HOPECARDIS) 2019, at Ritz-Carlton hotel, Mega Kuningan Jakarta, from July 12-14 2019. In the upcoming event, latest advances in cardiovascular management and their practical applications in clinical practice will be reviewed more in depth. We will share our clinical experience in Cipto Mangunkusumo National Referral Hospital and other hospitals around Indonesia over the years in the field of general and interventional cardiology. Our panel of experts include other medical specialties such as endocrinologists, nephrologists, tropical infection experts, pediatric cardiologists, neurologists, cardio-thoracic surgeons and other related specalists. HOPECARDIS 2019 workshops, which mostly will be held in Ritz-Carlton Hotel, consist of Basic and Advanced Electrocardiography, Basic Echocardiography, Doppler Vascular Ultrasound, and Coronary Intervention. This year, we are also introducing our new workshop with the title of How to Deal with Shock. We will also be holding an AHA certified BLS-ACLS course in conjunction with HOPECARDIS. It is our privilege to host this year's event and to work together with experts in their fields. We encourage you to participate in HOPECARDIS symposium and workshops. This Continuing medical education program is designed to meet the needs of internist-cardiologists, internist, primary care physicians, nurse and other health care professionals who work in the area and in the care of cardiovascular medicine. IDI will provide accreditation for participant, speaker and organizing committee for both workshop and symposium.